I told you all how I got an Xbox 1 last November. It came with digital copies of Tomb Raider and it’s 2015 sequel Rise of the Tomb Raider. I enjoyed playing through both and was excited to learn of a movie coming out directly related to the reboot series games. Fast forward to today, and I am happy to say the Tomb Raider movie was not a complete disappoint, like so many other video game to movie blockbusters (let’s not speak of the infamous Super Mario Bros). Tomb Raider the film is different because it’s actually made by the same game company, Square Enix. The film is a complete reboot that has little to do story-wise with the older Angelina Jolie versions. At the same time, it’s only loosely related to the newer video games. It takes a unique position of blending the two games into one while sticking to the general story of the first game by focusing on the search for Himiko’s tomb. Alicia Vikander plays an excellent young Lara Croft. She’s energetic, smart, and ready for adventure. Well okay, actually she was more than hesitant to inherit the mantle of the Croft name. The beginning is filled with her daring feats as a… bike courier? The first 25 minutes of the movie is slow and not Tomb Raider like at all. This act is a necessary part of the journey. Every legend has a beginning. Every hero has a backstory. Lara Croft begins as a biker around London. She seems to work for a local Indian mom and pop restaurant delivering ingredients throughout the week. However, it’s clear she’s gone through several odd jobs and tight on cash. To blow some steam, she fights in boxing matches. After losing a match against a rival, she enters a strange underground biking gig. She nearly wins the competition before getting hit by a car. Lara’s aunt Ana picks her at the police station and persuades her to finally sign off on the will of Richard Croft at his massive corporate complex. Since the owner’s disappearance nearly ten years ago, the billion-dollar “Croft Holdings” company has been under the operations of no-name executives. Ana, a close associate of Richard, would like more direct control of the day-to-day affairs (so she claims). She hopes to manipulate young Lara. The old lawyer hands a gift to Lara from Richard. Both are troubled to discover a mysterious message hidden in the ancient puzzle. The clue sets off a chain of events leading to the adventure to Yamatai. The origin story is a fresh perspective on the story. Though formulaic, it’s believable. The viewer can see themselves living the normal life of Lara Croft. Connecting the audience with the heroine made the narrative come alive. We all might dream of randomly discovering we are heirs of a billion-dollar conspiracy. The older games and movies merely pictured Lara as a badass treasure hunter. I think in D&D terms. While Indiana Jones is lawfully good, the old Croft was chaotic good. The Lara reboot isn’t so much concerned about the money or the ancient treasure. She primarily wants to find her father. Strangely, the new Lara isn’t even really an archeologist. She knows some history and is educated from when her father tutored her, but she hasn’t attended any university yet. If you think about, Lara found the tomb and solved its mystery all from her father’s journal. She didn’t actually KNOW anything. Her intuition saved her in the final part of the tomb, but she was bound to find out the true nature of the curse eventually. So, it’s not so much Lara’s historical or supernatural knowledge that makes the difference. Instead, her quick wit and endless determination make her… well, the Tomb Raider! The Tomb Raider closely follows the “hero’s journey” formula laid out by Joseph Campbell in a much clearer and enjoyed fashion than the games or previous movies ever did. The classic story format follows 17 stages. The hero has an ordinary life with ambiguous or missing parents. They get pulled away from their ordinary life by a call to an adventure. Hesitantly or even against their will (poor Bilbo), they embark on a long journey to another world with a mentor. Along the way, they suffer many trials and pains. The mentor dies at a pivotal moment, but he leaves the hero inspired to finish the quest. Finally, the hero directly confronts the greatest challenge and wins in the darkest part of the new world. The hero learns a valuable trait or knowledge and emerges transformed. They usually return to their old world, but it’s never quite the same. Sound like Harry Potter? Frodo Baggins? Luke Skywalker? Neo? Odysseus?… Maybe Lion King? You’re right! The most popular stories in our cultures aren’t very original in their presentation. Campbell’s book The Hero of a Thousand Faces analyzes the psychology of the hero motif and proves each beloved story is relatively the same. We’ve come to expect the typical kind of storytelling we love. Even good historians recognize the power of stories and try to craft the timeline of documents into the hero’s journey. Likewise, it easily applies to religion as the life of Jesus, Muhammad, and Buddha could all fit into the pattern of the classic hero. Traditional stories are considered “good” when they show how real and personal the characters and conflict seems in the strange fantasy world. The X-Men clearly has relevance to racial tensions that still linger today. Ready Player 1 echoes the frustrations of gamers at the greedy corporate industry. The Halo series has modern parallels to conflicts against misguided religious fanatics. The idea of great storytelling is making the fantasy seems real by connecting it in subtle ways. 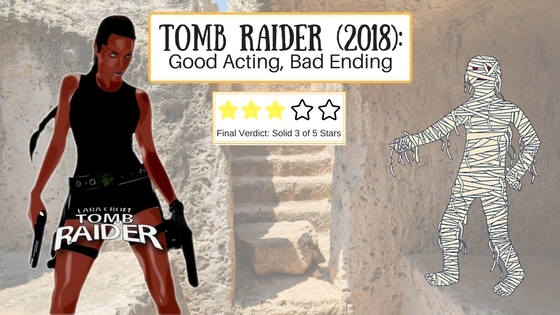 Tomb Raider does an awesome job of taking the wild archaeological adventure of Lara Croft and making it down to earth to the average viewer. It’s not really about discovering the mystery of Yamatai. The film is about discovering yourself and your relation to family amid confusing circumstances. In the beginning segment of the film, Lara could have just signed off the inheritance, let Ana run the business side of things, and walked out enjoying her new life as a billionaire. Rather, she chooses to hunt for the ultimate treasure – her father! The story hits home about renewing attachments to family while growing up and becoming independent. Even the villain wants to escape the island and return to his wife and kids. Interestingly, she had no family before leaving to Yamatai. At the conclusion, she’s been transformed by inheriting her dad’s quest against Trinity. She returns to London a true Croft… and just in time to pick up her classic double pistols. The movie version has somewhat to do with the games. It has the same setting and general plot as the first game – Yamatai and unlocking the mystery of Queen Himiko. That’s where the comparisons end. Just so we’re clear – the video games aren’t amazing in terms of gameplay but compared to the movie they have a way better story. Mathias is the same bad guy in name, but his character and backstory are entirely different than his game counterpart. The movie Mathias commands a group of Trinity thugs that have kidnapped wandering fisherman and use them as slaves to search for Himiko’s tomb. Trinity occasionally drops supplies, but Matthias cannot leave until he’s finished the job. The isolation from his family drives him to find the tomb at any costs, even trying to murder his friend Richard Croft when he tries to compromise the mission. That’s believable and fits the theme of connecting back with family… but the video game Matthias was an ordinary sailor that got marooned on the island by the constant supernatural storms. He survives for years by manipulating the weak minded fools that also get stranded. Eventually, he becomes mad crazy and gathers a cult following. He’s obsessed with finding “the one”, a woman capable of containing the soul of Queen Himiko. The soul of the ancient monarch has been trapped in her mortal body and leaves the island cursed with eternal storms, making it impossible for anyone to leave. Matthias kidnaps Lara’s friend Sam, a beautiful Japanese girl who believes she’s descendant of Himiko’s people. He uses some magic to transfer the trapped soul of the queen into Sam. Lara catches up with him just in time to stop the ritual from finishing. I preferred the movie Matthias. He was more ruthless but not too crazy and irrational. The story of both games focuses less on family and more on the consequences of seeking eternal life. In the 2013 game, Himiko is an evil queen that endures centuries by transferring souls into naive handmaidens. Then, the 2015 game is much more obvious from the start with the Eternal Prophet and his Divine Source. We learn from the Bloodlines DLC that Richard Croft became obsessed with finding a way to bring back his wife after she passed away suddenly in Tibet… but his research attracted the attention of the evil Trinity. Then, the games mix in the supernatural elements into the plot. We aren’t meant to live forever because we cannot play God and pretend to we’re invincible. We would destroy ourselves with that level of arrogance and pride. The supernatural is completely absent from the Tomb Raider film! I was deeply disappointed by that and discuss it further in the next section (SPOILER). The movie tries to fit nearly 40 hours of gameplay of two games into one two hour film. It simply doesn’t do justice to the games at all, which explains why they needed to shorten the plot and combine details of both titles. In the game, Lara explores most of the ruins of Yamatai, encounters the “Oni” samurai, discovers connections to feudal Japan and WW2, and learns to use several firearms and bow types. My favorite part of the game was chasing this helicopter as a burning castle collapses all around you. I loved escaping the cult’s dungeon pit full of crazy people in a cavern with volcanic gas vents. It was awesome to sneak around the giant Oni and spy on the final ritual. Not to mention, I felt satisfied seeing Whitman get what he deserved. The movie? It skips all the juicy fun parts of the game and jumps more directly to the tomb scene (minus the samurai). When you compare the movie and the games, the film just isn’t as epic. It stuffs too much content into one sitting and compromises the rich story. In fact, the movie Lara seems to solve the mystery of the tomb on the same day she arrives! It’s kinda ironic the movie’s theme song is “I am a Survivor” when there’s very little surviving involved for Lara. She doesn’t hunt or camp out on her own in the wild. At most, she spends a few hours at night alone and then finds her needed mentor. I guess the idea was more about her family line and reputation surviving? Finally, the games have a different backstory for the heroine. The first game starts out with Lara on an expedition aboard the Endurance with Dr. Whitman, her best friend Sam, and her father’s friend Roth (the game’s mentor). Then, there are the minor characters that make up the crew of the ship: the cook, mechanic, nerd tech dude, and fisherman (ironically named Jonah). Lara is some intern student under Dr. Whitman, and together they are trying to create a documentary of the Yamatai island. Things go wrong when they find the island surrounded by storms. They crash land and everyone gets separated, most slowly being killed off by Matthias’ goons. The first game was a kind of an origin story for Lara, but it differs in significant ways. You never really find out what happened to Richard Croft except that he died suddenly in the pursuit of his crazy research. Lara is also educated in the game and has extensive knowledge of history, even being able to spot fake artifacts on other shipwrecks. I enjoyed the game Lara more because she studied about archaeology and discovers the plot using her hard work in puzzle solving. The movie Lara turns out to just be a good guesser based on the tomb drawings. The Tomb Raider movie had surprisingly good acting. Most game-to-movie productions are cheap and somewhat dumb on the acting side. Mortal Kombat and the recent Warcraft films didn’t have inspiring performances. Vikander, on the hand, delivers a compelling character that redeems most of the film’s storytelling. Vikander’s pretend British accent sure fooled me! She’s actually an awarding winning Swedish actress. What’s cool is she trained for seven months to gain 15 pounds of muscle and that impressive six-pack. She looks the part and plays it convincingly. She’s still a young lady at the beginning of the film but strong in a determined way. Walton Goggins plays a dangerous and dark Matthias Vogel that constantly has a face of mad desperation. In the most intense moment of the film, one of the laborers gets sick and collapses. Matthias points his gun from person to person like it’s nothing before finally shooting the dying man. The audience partly feels bad for Matthias. He’s just a family man that wants to get home as quick as possible. Lara’s friend Lu Ren, the drunken sailor, is played by Daniel Wu. He sort of takes the place of Roth in the film and does well as a secondary hero in rallying the slaves against Trinity. It was too bad he didn’t have a more significant role. It would have been cool if he returned with Lara to London and became like her sidekick partner in crime. Then, we have Richard Croft… yes, that’s right… he’s still alive on Yamatai. English actor Dominic West plays the frail old archaeologist. He’s better known for the TV crime drama The Wire. Richard appears in several flashbacks while Lara is in London, and then she discovers him on the island about halfway through the film. The revelation of Richard living was more annoying to me than anything. As soon as he appeared, you knew he had to die. He has the role of the mentor in the hero’s journey, so naturally he must die at a critical moment in the narrative. That’s just how the formula works. Besides, Lara needed to inherit Croft Holdings and continue the legacy of the family. Her father was a crutch to her destiny. I know that sounds harsh, but it was super annoying having her dad baby her around the remainder of the movie. It wasn’t very Tomb Raider like for her to need a guide so caring and tender as Richard. Plus, the film ultimately took away the secrecy of Richard and his research. The backstory of Richard and his romantic connection to Ana played a huge part of the Rise of The Tomb Raider. The game even leaves you hanging with a post-credit cutscene that opens up the question of who really killed Richard. Was it Trinity or something bigger? The movie is more straightforward and doesn’t leave any mystery that makes the Tomb Raider… well, Tomb Raider. The destructive powers of Queen Himiko, the biggest mystery of all, is cleared as just a contagious disease. Himiko carried a horrible disease but was somehow immune to it herself. Her generals used her as a biological weapon. Now Trinity hoped to do the same. The film reduces the queen’s supernatural control of the weather and eternal life to an advanced Bubonic Plague. I was deeply disappointed in that ending because it lessened the thrill of the adventure. The queen and island didn’t have anything special about them. The supernatural aspect of the games made them fun and the story more detailed. If you played the game, you will start watching the movie expecting something way more epic and are left disappointed. Overall, the movie fails at reaching its potential by heavy abridging and altering the source material. The characters are fun and have good acting, but the ending is a letdown. For these reasons, I give the Tomb Raider a solid 3 of out 5 stars. On a side note, we need to discuss the biggest plot hole in the Tomb Raider: how did the recorder in the basement still work after 10 years? Must have had some amazing batteries to last that long.